The other day we went on a Magical Journey. Literally. Grumpy elves in a muddy field trying to convince small children and their fee paying grown ups that the ever so slightly inebriated Santa in the sparsely decorated cabin is the real deal. A few stuffed penguins and the odd polar bear dotted around a handful of Norwegian spruce trees and there you have it. So when I came across this particular experience dreamt up by the designer Laurence Llewelyn Bowen, I thought it would be different. Classy even. No one that famous would surely put their name to a failure. I fell for all it promised and booked our tickets. Then it opened. And closed. In less than 48 hours. Social media was awash with complaint. Smoking Santas, reindeers that bite and drunken elves were just a few of the horrors that were apparently witnessed by families on the open day. Though many of those accounts have since proved to be as mythical as the Journey itself. There was, it seemed, very little magic to be found. The organisers appeared on television to make amends. Or were they Elves? Difficult to tell really, both wore red faces. Heads were hung in shame and promises made to do better. Just give us three more days they said, and it will be Magical. So we did. And it was. Searching for Rudi the missing reindeer. Calling his name and looking for elusive hoof prints. Buying into the museum of artefacts that proved Santa’s existence; spending time pouring over each one…fuelling the children’s excitement and building anticipation. Trailing through the makeshift forest, wondrously covered in fake snow whilst looking for fairy dust. Knowing that it was all fake, (not just the snow) but in that moment, we were in Narnia. Aslan was on the move. This was real. I couldn’t help but notice that there were just a few people on the Magical Journey who could not see what we saw. Arms folded, they waited to be entertained at every stage. After all, that’s what we do nowadays. Pay for entertainment. Instantly. Now I know I am easily pleased when it comes to this kind of thing. Even before I had children of my own I didn’t need much to fuel my imagination. Give me a garden and I could give you a fairy hunt. Take me to a castle and I would fight knights and dragons. But having a child with Down’s Syndrome has taken me beyond my own imagination into a world that has to be viewed through different eyes. Hazel causes, no. Forces, me to pause. There is no rushing on to the next attraction. We have time to stop. Time to play. Time to appreciate. Time to notice. We go at her pace, her speed, and, in doing so, we begin to appreciate even the smallest of details. Very often we are late for the show, or even miss it altogether. Something happens. Sensory overload usually. The excitable child in the toddler group who squealed in a way she didn’t understand. The supermarket tannoy call for more cashiers that frightened her, causing us to abandon our half-filled trolley and make for the exit. The music at the party that was too loud and we had to leave the room. We have left so many rooms. That’s when it happens. That’s when the discoveries are made. Like finding her shadow for the first time on the wall outside; a magical new friend to dance with. Or, like sitting on a crowded train, trying hard to pacify her each time a station is announced. Dreading the upcoming tunnel only to find, once inside, that she can see herself clearly in the darkened window. There’s her friend again. Smiling back right back. Her face lights up the whole carriage. Such pleasure derived from a reflection. Or a visit to the zoo where she resolutely refused to look at a single animal. Taking instead inordinate pleasure from lying face down on the grass and running her fingers through it over and over again. Not even a 14ft giraffe very close by could take her attention. At home, her playroom is filled with toys and games designed to entertain, educate and thrill. 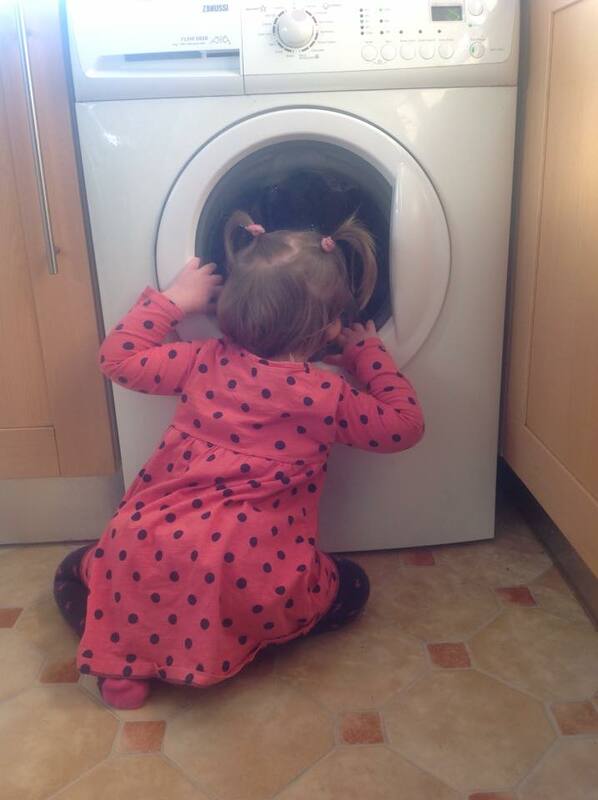 Yet no toy holds her attention in the way the washing machine on a full spin cycle does. If I’m honest, I wish we didn’t have to keep leaving the room. Or the shop, or the bus or wherever it is that she can’t cope with today for whatever reason. When it happens I leave with a heavy heart. I would much prefer it if she were able to join in and be like everyone else. But she is not. And that’s ok. Because actually what I am probably feeling is a desire for me to be like everyone else. It’s mostly out of self-centred reasons that I wish for these things. Hazel has no sense of missing out on the fun whenever we leave a room. Just a sense of relief. Calm returns. So does Hazel’s smile. So does mine. I am slowly learning to let Hazel be Hazel. She does not have to fit in with every activity or social situation. Oh, I know it’s important for her to try and learn to cope in social situations and that taking her out each and every time something upsets her is not always the answer. But, sometimes, it is the only answer. It’s ok that she spent the whole session at the toddler group playing with a door stop and not the array of carefully thought out toys in the room. She loved the doorstop. It’s ok to stop trying to make her into who she is not. It’s ok to leave the room. It’s more than ok.
And it can even be magical. Categories: Uncategorized | Tags: Down Syndrome, Down's Syndrome, Magical Journey, sensory overload | Permalink. And yes, we are late for everything too, but it is joyous to stop and see things from our children’s viewpoint isn’t it… so long as you aren’t late for an appointment that is. 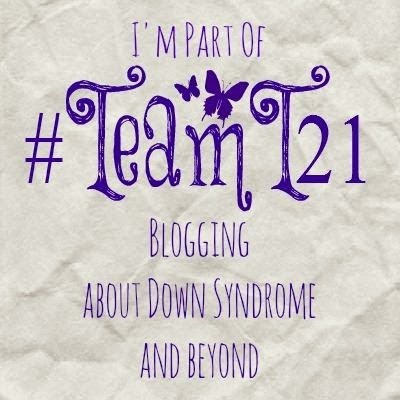 Merry Christmas to you all and thank you for joining the #TeamT21 linky.